Belper is perhaps most famous for its place in the Industrial Revolution, and the presence of the imposing mills that once dominated the town and its people. It was the mills of Jedediah Strutt, on land bought for him by William Slater, that transformed Belper and brought prosperity to the town.. But although the main development of the textile industry occurred with the arrival of Jedediah Strutt, there is some evidence for its presence prior to this. A very early cotton mill was worked by two horses in Paddlewell Yard, c 1730, by Joseph Robinson, spinning raw cotton brought from Manchester by pack horse. Similarly, although the hosiery business really took off from around 1795, with the hosier John Ward and his son opening a warehouse at the southern end of Belper and purchasing their yarn from the Strutts mill, it seems that Ward had been trading as a hosier in the Belper area from about the early 1760s (Harte 1977). with two good stables and about an acre of land adjoining the same." was advertised for sale in 1785 due to Joseph Robinson's bankruptcy. Also for sale are the entire contents of the Mill, various pieces of land, houses, and two Inns which appear to be the Upper Swan and Bull's Head. By August 1787, two years later, it is his son William who is handling affairs, and Joseph is "late of Belper". Robinson's Cotton Mill. In an interesting paper read before the Belper Natural History and Philosophical Society, by the late Rev, Robert Hey, Vicar of Belper, in 1878, the statement was made that the cotton industry was introduced into Belper prior to Mr. Jedediah Strutt taking up his residence in the town. The Mill was situated at Chapel Hollow, on the Denby Road, and belonged to a person named Robinson. Cotton was brought to the town on the backs of pack horses. The old mill had deep cellars in which two horses worked the machinery by the familiar method still to be seen at well-to-do farm houses. The work was very heavy, and every few hours fresh relays of horses were taken into the cellar and the others brought up covered with foam. "Paddlewell Yard" remains to mark the site of the old mill. High Street north, St John’s Road east and Lander Lane west. Towards the north-east of the area there is said to be the site of a cotton mill that predated Strutt’s arrival, the mill having deep cellars in which two horses worked the machinery (see section 5.5.7 above). Hope (1893) refers to this as ‘Paddle Well, in the old cotton mill yard’ and states that it got its name from the raising of water ‘paddle-wheel fashion’ and that it was ‘done away with’ following an attempt at suicide there. 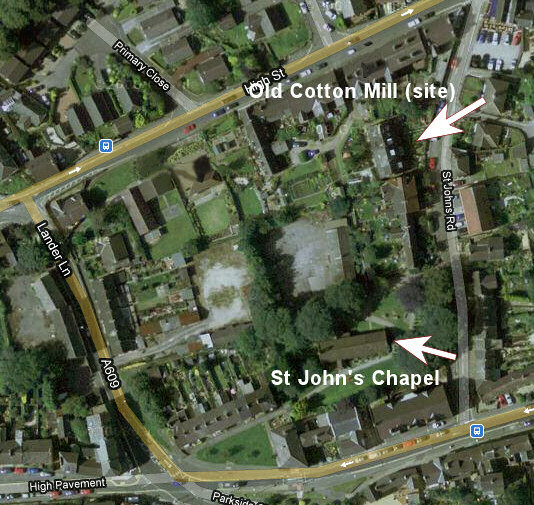 Jennings (1971) states that the cotton mill is ‘now’ four cottages off High Street and that there is some evidence to suggest that simple small-scale cotton spinning of coarse yarn was carried on in the buildings as early as 1740. He also notes that ‘some slight trace’ of the horse gin in the cellar survives. There were a number of nailshops in this area in the 19th century, of which a couple are believed to survive, although considerably altered. Several other buildings of 18th or 19th century buildings also survive. Paddle Well. In the old cotton mill yard was a well called the " Paddle Well." It is believed to be the only well in Derbyshire from which water used to be raised paddle-wheel fashion, hence its name. It was done away with in consequence of a suicide, or an attempt at suicide, by a woman who had quarrelled with her husband. From "The Legendary Lore of the Holy Wells of England" by Robert Charles Hope originally published by Elliot Stock in 1893. It is therefore of interest to me that the Robinson Family cropped up when I looked into the ownership of the land surrounding Field Row, Short Row and the Unitarian Chapel which after the arrival of Jedediah Strutt became workers' housing. Could it be that the Strutts obtained prime pieces of land as a result of Robsinson's downfall? I stumbled over the Robinson connection to the families who owned this land before I read that a man called Robinson was, in effect, the first rival to the Strutts in cotton production. Joseph Robinson the Cotton Spinner is listed as a bankrupt "Joseph ROBINSON cotton spinner Belper bankrupt 30 Nov 1784" in the Derby Court Records. This was less than ten years after Jedediah Strutt arrived in Belper and set up his superior water-driven cotton mill. In the year of Robinson's bankruptcy, 1784, Jedediah Strutt was well-established in his thriving water-powered mill complex with North Mill nearing completion. He was advertising for workers locally and expanding in all directions. It is not hard to guess the result on Joseph Robinson's inferior cotton mill trade. Following bankruptcy proceedings, a series of advertisements appeared in the local newspaper detailing his property to be sold at auction. the estates and effects of Joseph Robinson of Belper, a Bankrupt. on Tuesday 3rd of May at two o'clock. with two good stables and about an acre of land adjoining the same. One other piece of rich land called The Eyes, containing two acres more or less. One other piece called Glue's Croft (Glew's Croft) containing three roods. Also about three acres of exceeding good land at the White Moor in possn of Joseph WATSON and John VARNEY. One tenement and garden in possn of Thomas WARWICK. ...with common rights upon an extensive piece of land near the Town. Apply to Samuel JACKSON at Belper. To be sold by Auction at the house of Susannah Jackson the Bull's Head in Belper. All that newly-erected Public House situate in the Market Place in Belper with a brewhouse, stable, croft and garden adjoining in the possn of Susannah JACKSON with one other stable, barn and cowhouse upon the said premises. Also that well accustomed INN known by the sign of the UPPER SWAN, facing the Market Place in Belper together with a barn, stables, orchard, garden etc in the possn of William WATSON. Likewise, two dwelling-houses, one in possn of Joseph WATSON the other in possn of Benjamin BRIDGES, together with a barn, stable and piece of excellent land called Dam Close containing about two acres. 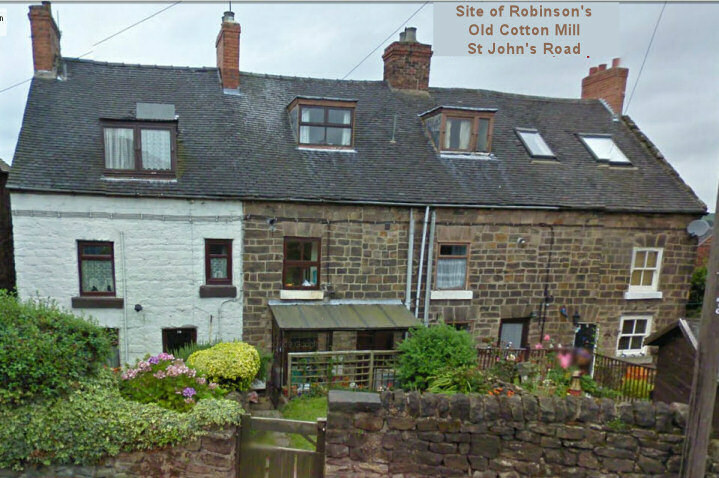 Also three messuaqges or tenements near the Tan-Yard in Belper now or late in the possn of Benjamin ANNABLE, Robert HALSWORTH and William HODGE with gardens to each, together with a stable and cowhouse in possn of Mr MILNES. Also one piece of rich meadow-land known by the name of GRATIAN'S CROFT, in Belper, containing about two acres more or less. Also two ditto in possn of John BERISFORD and Samuel KIRK. NB. the above are freehold with right on commons near Belper. Also five acres of fallow wheat, etc etc at White Moor. A variety of articles in the cotton-spinning business. Creditors who have proved their case are to meet. Suits are against Joseph Robinson and William Robinson both of Belper. All the above-mentioned house (Bull's Head, presumably) with brewhouse, stable and croft adjoining, with stable barn and croft, and cowhouse. Also a piece of land near the Fleet in Belper. NOTE: Joseph Robinson may now have died or left Belper. He is spoken of as "late of Belper" in 1787, August. A meeting to look into the claim of WILLIAM ROBINSON, son of the Bankrupt.